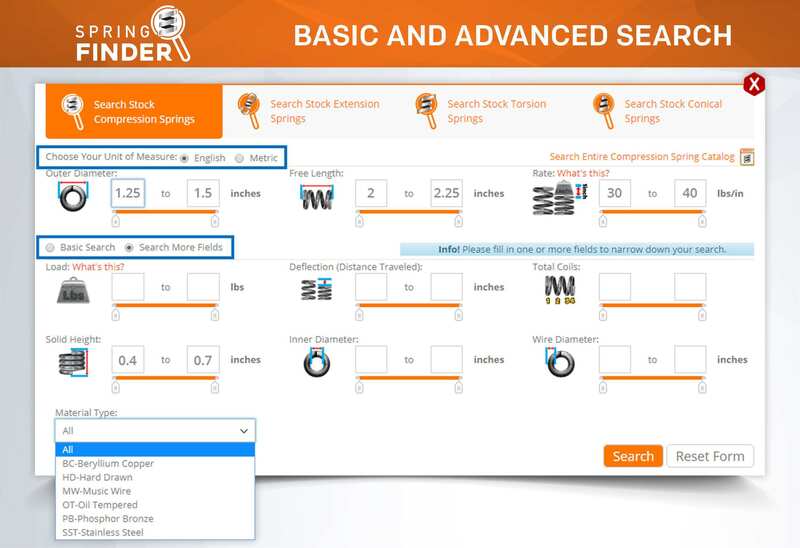 Definition: Conical spring finder search engine used to locate a specific cone or tapered spring which meets the dimensional ranges specified by the user to accomplish their needs. Search, Find, and Locate Your Conical Spring! 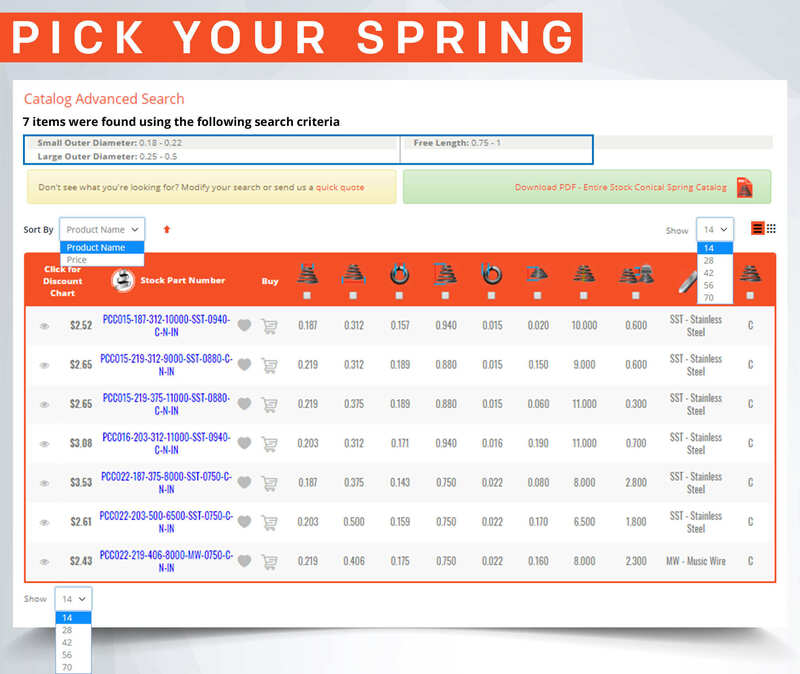 Search for your tapered springs and locate them FAST using The Spring Store's Cone Spring Finder. 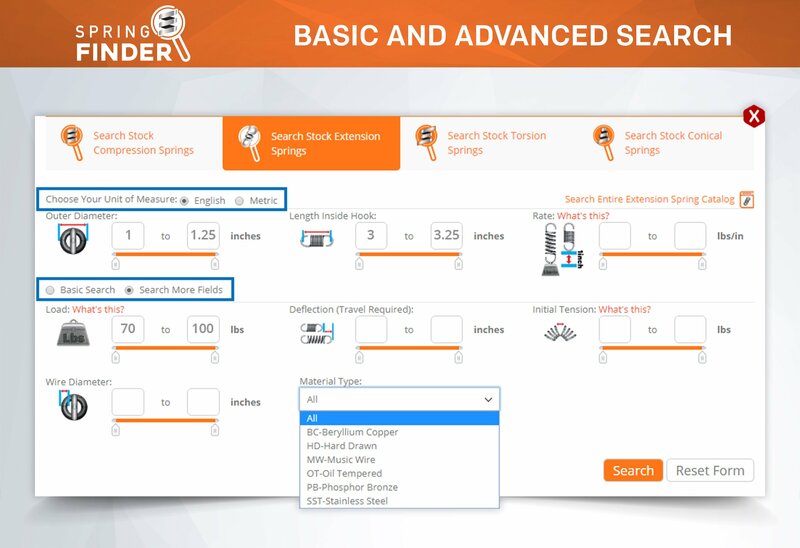 Spring finder allows you to find the ideal stock spring for your mechanism, device, invention, etc. amongst approximately 400 stock conical springs in our tapered spring catalogue store. You only have to input one dimension and enter the ranges in which the dimension will be searched by. 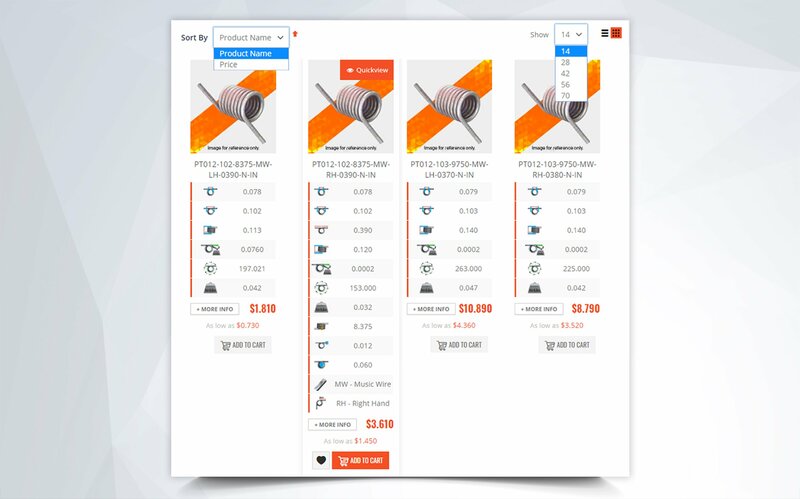 The options for a quick, basic search are small outer diameter, large outer diameter, free length, and average rate. There is more, though. 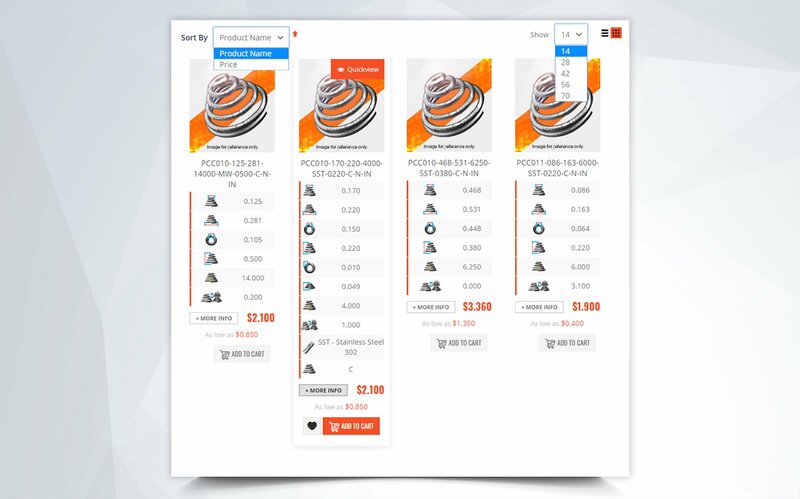 You are able to click on the option "Search More Fields" at the bottom of the Finder. 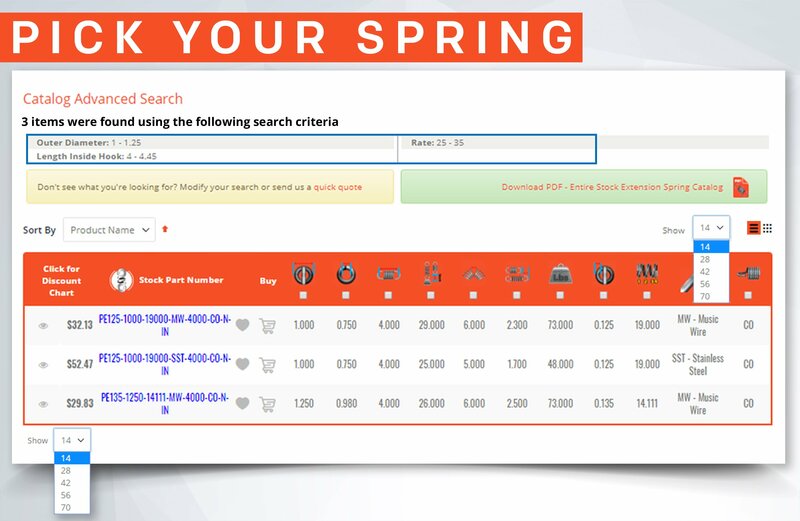 These spring specifications include total coils, solid height, wire diameter, and material type. 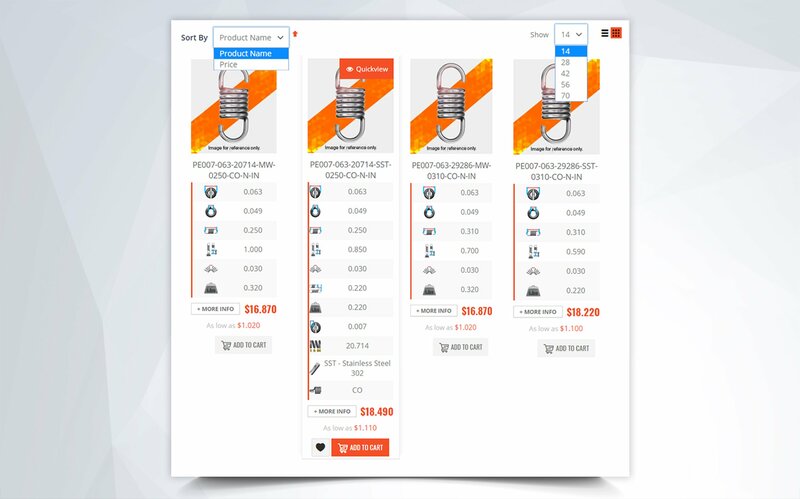 The following diagrams and examples will show you the step by step process of finding your torsional spring. 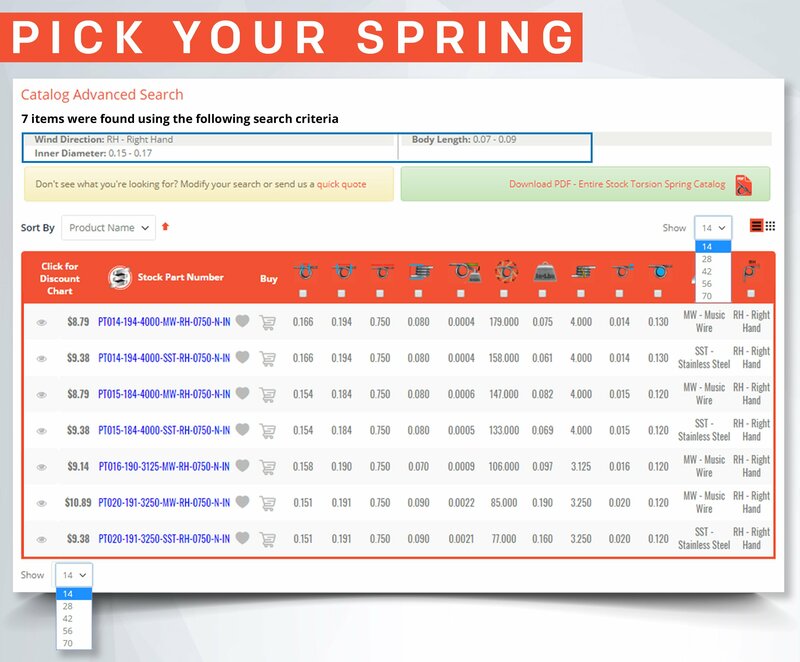 Spring Finder is a fast and easy to use search engine. 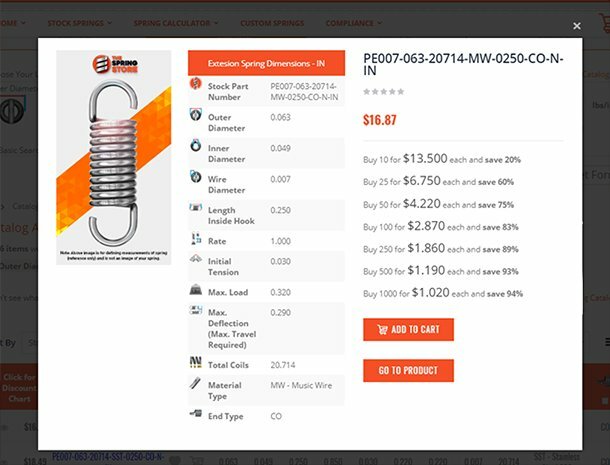 It is user friendly and provides you with a how-to-measure diagram as well as icons for each respective conical spring dimension. 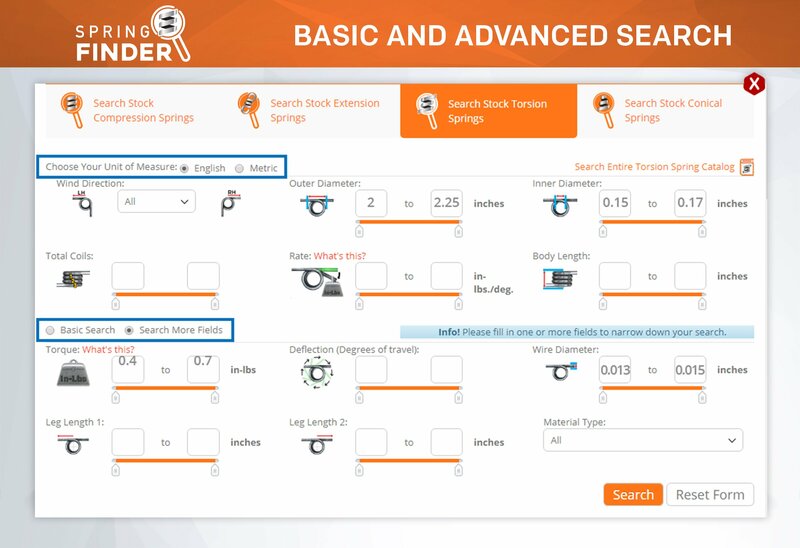 The following are the spring dimensions Spring Finder allows you to use when locating your stock torsion springs. 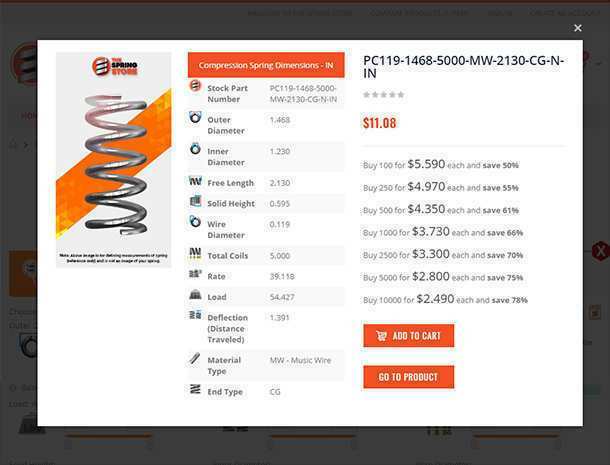 Small Outer Diameter - The outer width (outer diameter) of your spring's smaller end coil. 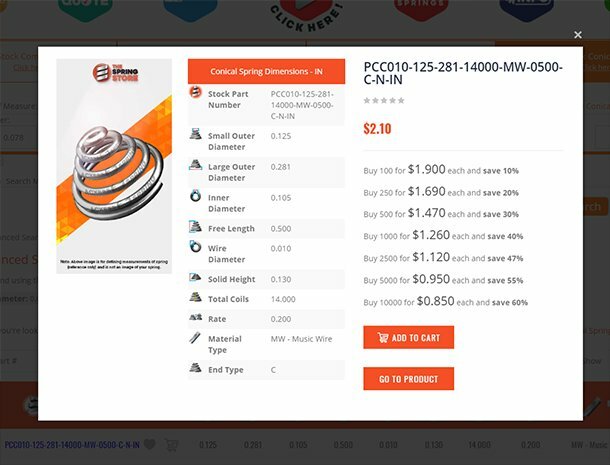 Large Outer Diameter -The outer width (outer diameter) of your spring's larger end coil. Rate - The average constant amount of force it takes for your tapered spring to travel one inch of deflection (lbs/in or N/mm). In this case, since cone springs are non-linear, the rate is only an average. Total Coils - The amount of spirals (coils) that make up your spring's body. Solid Height - The overall length of your spring's body when all the coils are touching. Wire Diameter: Affects spring force and determines an approximate range of your tapered spring's size. Material Type - The type of wire used to manufacture the spring. 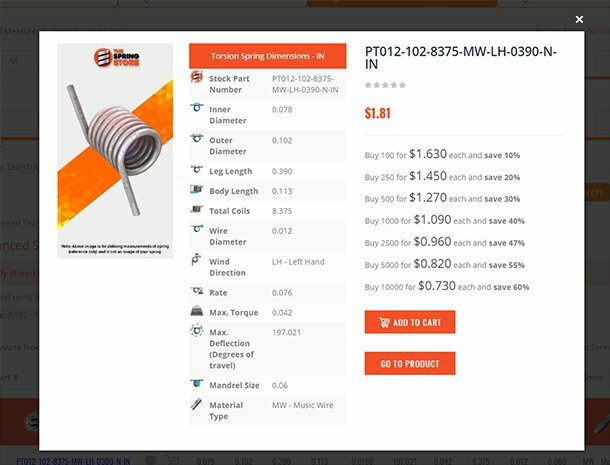 You may choose from music wire (MW), stainless steel 302 (SST), stainless steel 17-7 (17-7), beryllium copper (BC), hard drawn (HD), chrome silicon (CS), oil tempered (OT), and phosphor bronze (PB). 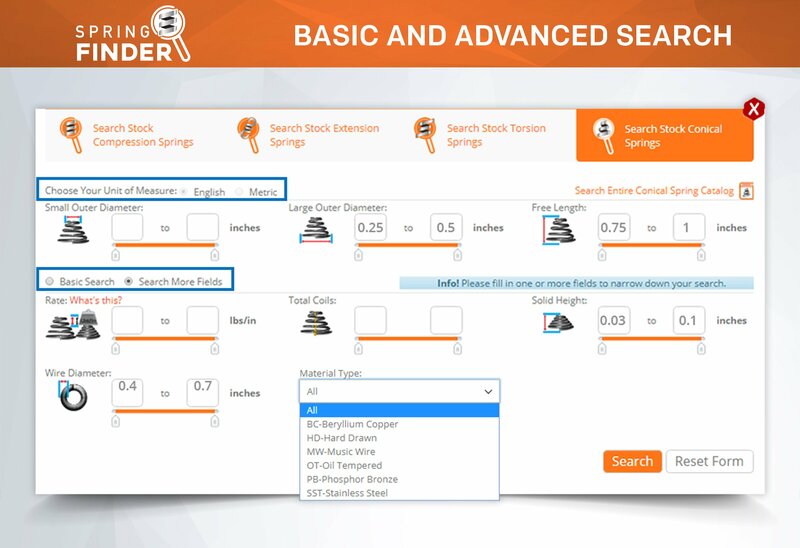 This is where you click on the "Search" button and get all the stock tapered spring results that Spring Finder was able to locate in our conical spring catalogue. Locate the cone springs which might work best and find the ideal tapered spring for your mechanism. 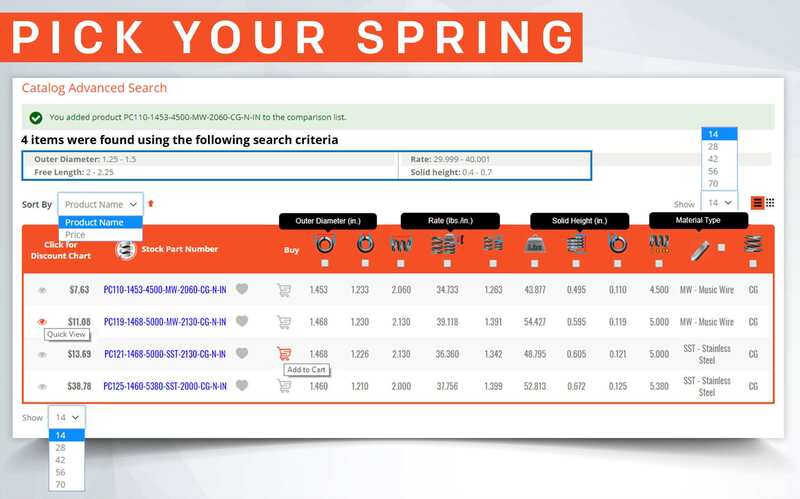 Select the springs which you find the closest to your design. 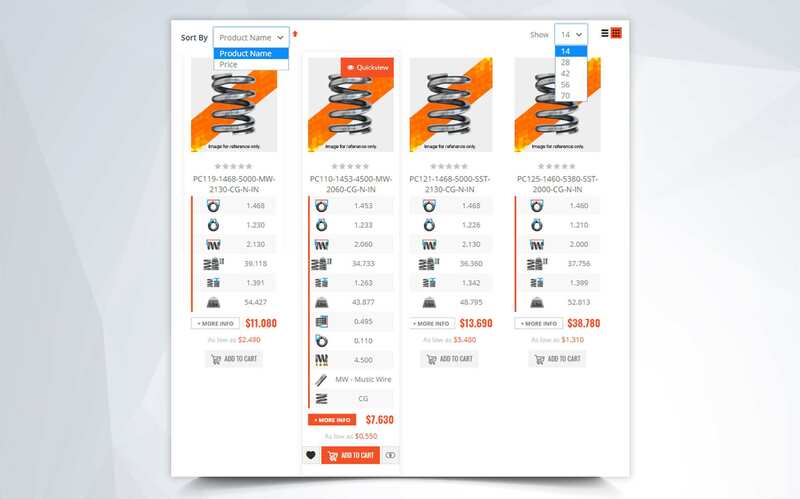 Then, you may compare the dimensions and specifications like average rate.